Is there a better alternative to Tagbuch Pro? Is Tagbuch Pro really the best app in Personal Info Managers category? 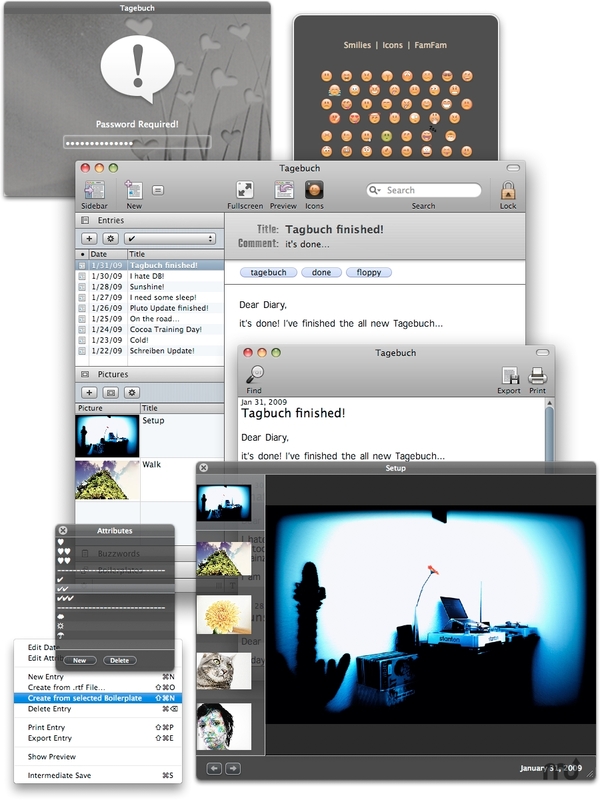 Will Tagbuch Pro work good on macOS 10.13.4? Tagbuch Pro... Your digital diary. Chronicle your life. The journaling app for the rest of us. You can use it as a digital replacement for your diary or you can use for writing whole books. Or use it to track your migraine, medication, health, sports et cetera. Tagbuch Pro needs a review. Be the first to review this app and get the discussion started! Tagbuch Pro needs a rating. Be the first to rate this app and get the discussion started! Write in fullscreen-modus, create boilerplates for recurring tasks and events and if needed, password-protect your entries. Tagebuch Pro is also available as a portable application, can AutoSave your data and an "analog" diary you would not read entry for entryï¿½so there is also a window for reading the whole book and of course you can search for almost everything.